I read this book as an optional reading requirement for a graduate level course in Cyber Intelligence. This book gives an interesting perspective from two inside men's view of the Cyber threat to this nation. The authors don't try to overload the reader with a lot of technical jargon trying to justify their position at the micro level of cyber security. Throughout the book, the authors use anecdotes and personal experiences to bring home THEIR point of view on the cyber threat to the US. I like this style of writing as I can relate to someone walking through their opinion forming process much easier than I can digest a litany of statistics and facts on a topic. Although, a healthy amount of that is critical to forming a valid, sound opinion (see my criticisms of this book). I did appreciate that the authors were trying to convey how they came to their current world view on the topic and what the Nation's leaders are facing in dealing with these challenges. My criticisms of this book lie mostly in how little citation of recent examples (recent up to when the book was written, not 2015) was used in the book as support of the position of the authors. Much of the referenced facts and information provided in the book was pretty old, dating back to the late 80s and 90s, and the challenges that were faced back then (also included early 2000s). So much more has happened in this space since then, even up to when the book was written, that I felt that more discussion on recent findings would have been more warranted, as well as addressing some of the dissenting viewpoints out there to even further solidify their positions. Also, citations of any facts are practically non-existent in this book. Much of the facts presented are in the form of, "I had a discussion with Mr. X one day" or "It was found at the XYZ conference that...", which wouldn't really hold much water in an academic setting (why I was reading the book in the first place). Still, setting that aside, you can take the book for what it is, accept their statements as their perspective on the topic and cross-check it with other sources that may or may not corroborate their findings. 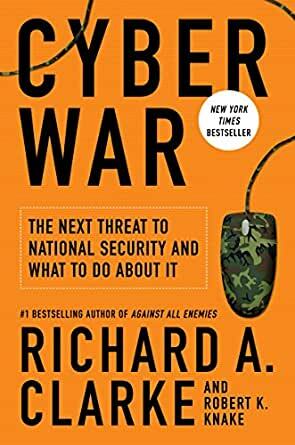 This book is entertaining to read, informational and definitely makes you think about the cyber challenges we face in not just the U.S., but the world as a whole. This is a highly interesting book in many aspects. Firstly there is the analysis of the technical shortcomings of the web, which if worst come to the worst could lead to war. This was done quite convincingly. Secondly there is the political analysis of why a defense is highly necessary as all countries, even the USA is vulnerable. Thirdly it discusses ways how to improve the situation. The author having been part of the political system at almost the highest level speaks with great authority about the past, the present and how experts would like to see the future. It’s a must read for all leaders, from company CEO’s to presidents of countries. Highly recommended. 5.0 out of 5 starsA must read for IT and government leaders. I found it amazing that this book written a few years ago is as relevant today as it was then. Just this week, the President talked about the need to attack cyber crime, never focusing on the obvious extended version of cyber crime - cyber warfare. While I am sure that some of the conditions mentioned in the book have evolved, maybe even improved, I felt that I could have been reading something written a few months ago or this week. The descriptions of how code vulnerabilities are created and the lack of testing for code quality is startlingly accurate and the lack of sensitivity to that by developers or their organizations should not surprise anyone, but it does. As Mr Clarke points out, there is so much lack of understanding how this all works at every level of government and business that to energize leaders to do something about it seems not daunting as much as impossible. It seems clear that, as he points out, eventual disasters will cause a great outpouring of investigations, inquisitions and blaming sessions assuming that we survive long enough to conduct them. It would be preferable for this and other "warning" books that point out what should be obvious might create a discussion into how the inevitable can be avoided or mitigated before it happens. I found this book to be extremely valuable in laying out the case for improvement as well as explaining the political reasoning behind our inability to act to attack this problem. It should be a "must read", particularly for leaders throughout the IT industry and government. It would seem that Mr. Clarke wrote this book to present the case for preparing for the next war and not the last. He eloquently expresses his frustration with both the Bush and Obama administration over the lack of commitment to fighting this next war. He makes a compelling case that the next war will be determined by the most effective deterrents and offensive capability of destroying the opponents technical war making capabilities. It is more of a policy argument than a how too but that should be expected because that is where these decisions are made. The book was written before 2016 so there is no consideration of denial that cyber wars are already underway.